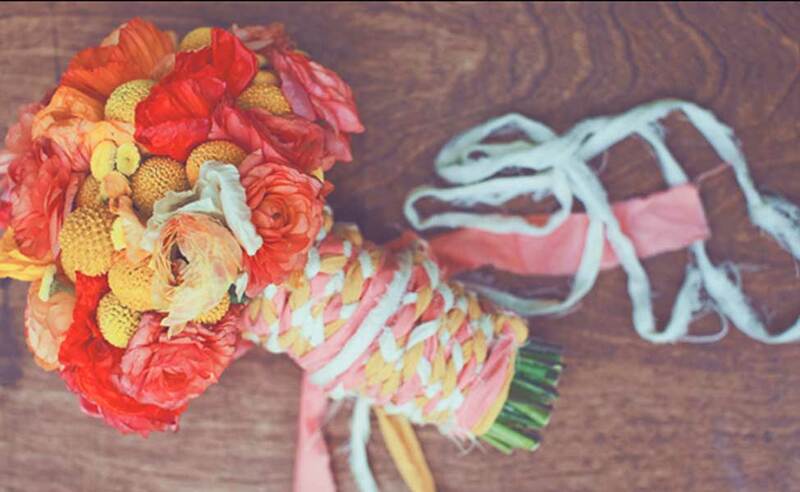 I don’t know what it is, but lately beautiful bouquets with long, gorgeous, ribbon streamers have been on my radar. It does feel a little throw-back, old-school, but if done right, I think it can completely pull together a look and bring a touch of charm to a bouquet. 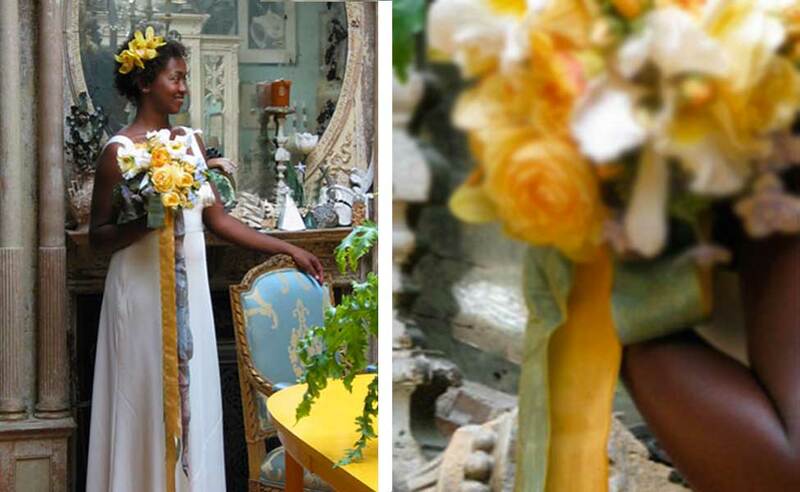 I love the extended length of ribbon on this bouquet by floral master Ariella Chezar, it adds so much drama to the bride’s silhouette. Oh, SAIPUA, you’ve done it again with perfect Wabi Sabi elegance. 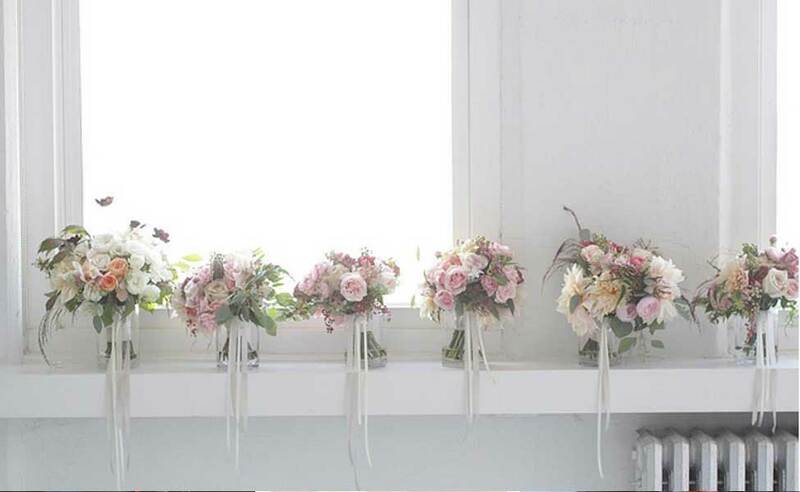 These bouquets have just the right amount of delicate streamers for an effortlessly beautiful look. 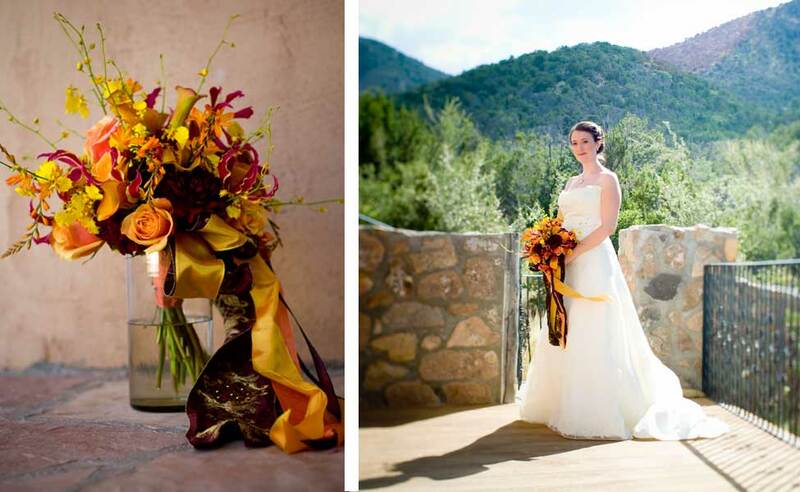 I’ve always loved this bouquet by Santa Fe’s very own, Marisa of A Passion Flower. The dark burgundy ribbon was ornate as ever with embroidered, gold threads and beads. 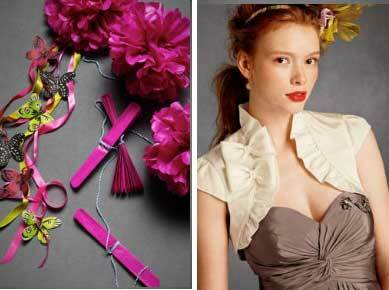 These punchy palettes are brought to life with a festive array of ribbons. I just adore how they look over the gray bridesmaids dresses too. This look can even be done beautifully is a rustic fashion. 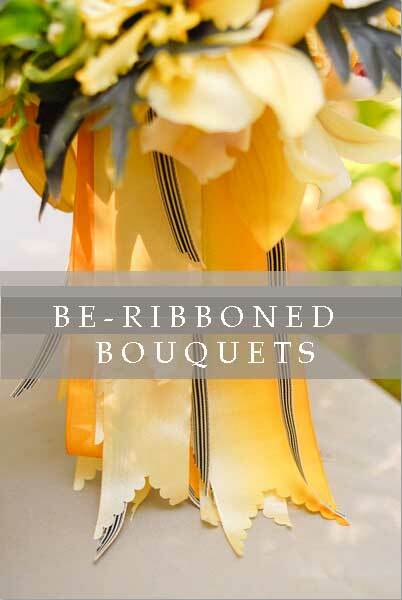 Braided ribbons, made out of strips of fabric, hint at a casual playfulness! Calling all brides, bridesmaids, and anyone that likes pretty things!!! BHLDN is having a sale! Got your hot little hands on dresses, shoes, fascinators, boleros, purses, necklaces, earrings…need I go on? 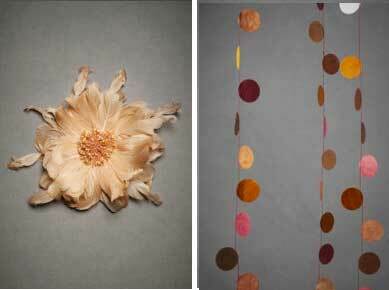 They have even slashed prices on décor items like garlands, pennants, cake toppers and more. 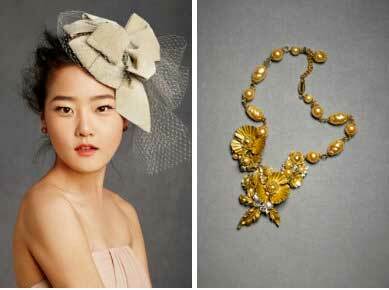 So get you buns over to BHLDN, click HERE for some serious eye candy! Many years ago I received a giant box of embroidery yarn from my Great Aunt Penny. In the box were about 50 Ziplock bags of yarn divided according to color. Each bag had several shades of color in 3-yard lengths. Since they were so short, they were never good for big-ol’ knitting projects but perfect for accents and smaller craft projects. 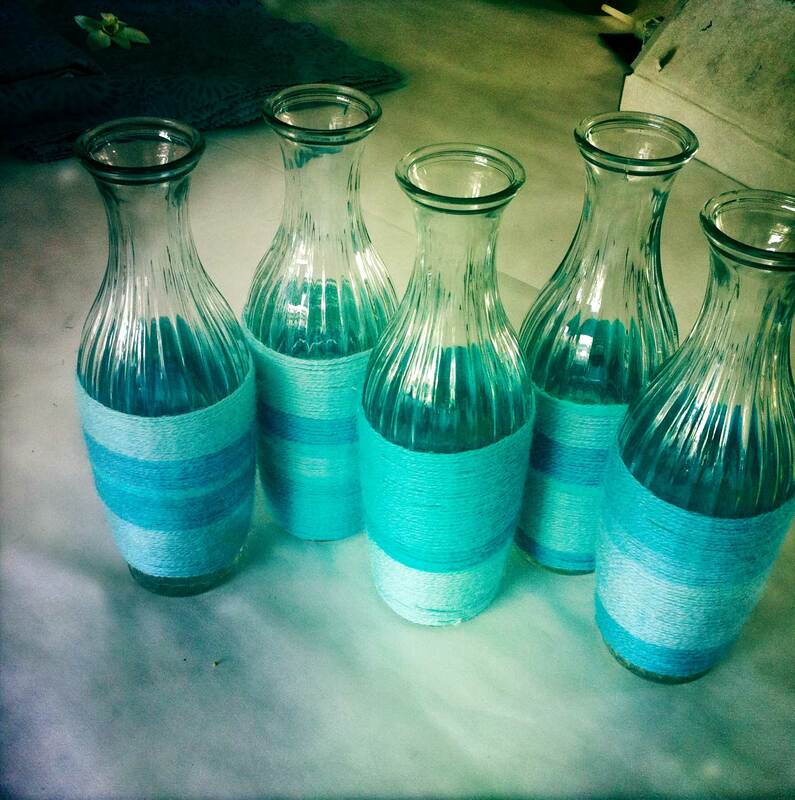 I was working on my brother’s wedding flowers and we needed a turquoise element on the tables. (Something we do quite a bit here in New Mexico!) We had some cheap vases that were pretty “meh” and I thought, “Hey! I can Up-cycle these up with some yarn! I’ve got a ton of it!” My brother and his fiancé had planned a rustic ranch wedding with many homespun elements, so the yarn would match perfectly into the motifs. This was such an easy and fast projects, all you need is some hot glue! 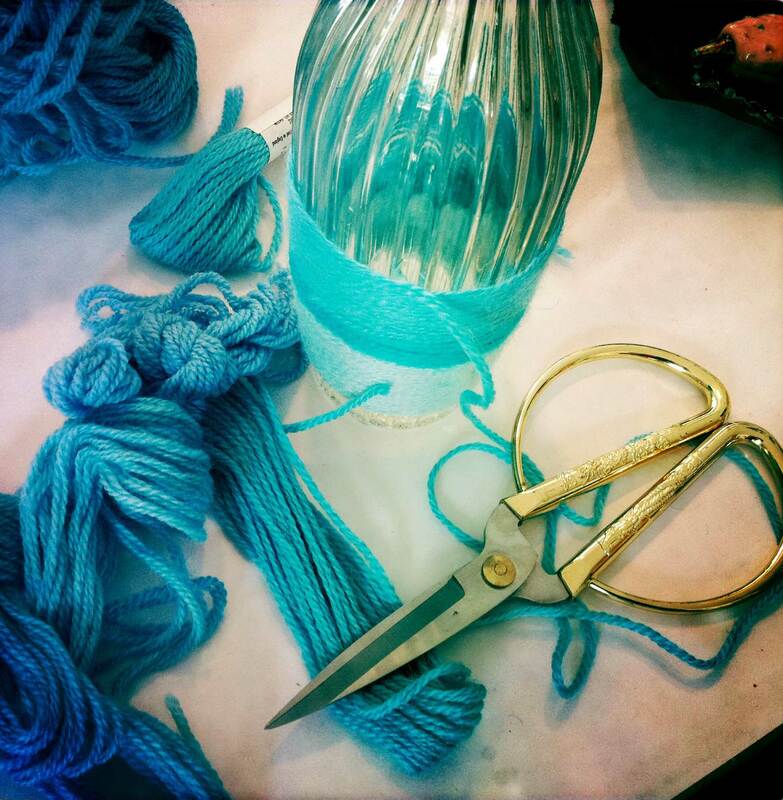 Start at the bottom of the vase; just dab a little on the glass and quickly press the yarn onto it. Wrap it around the vase and keep adding dabs of glue here and there to keep the yarn in place. I decided to change the widths and shades of blue to keep the pattern random and I was just so pleased with the result! 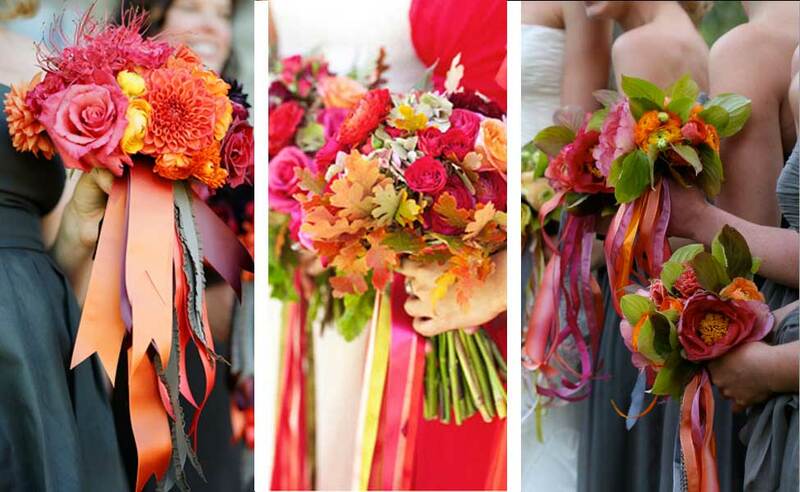 This would be a great project for a Autumn or Winter wedding to bring some warmth to a centerpiece. Imagine it with a really chunky yarn! 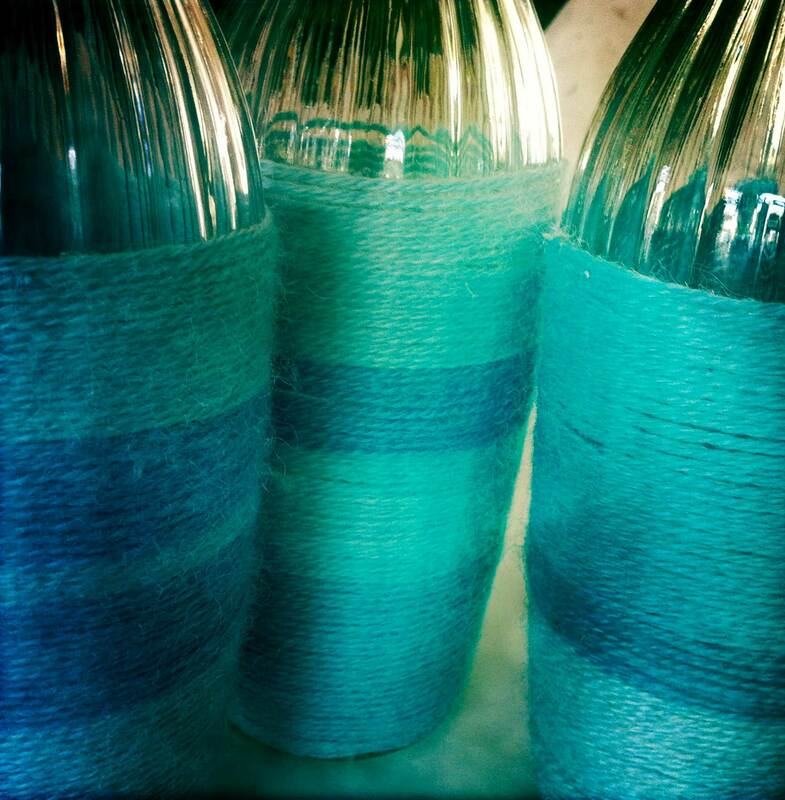 Do note, it is difficult to keep the yarn in place one the vase begins to taper, so this project will work best with cylinder or square vases that are an even width. Growing up, some make friends while others are lucky enough to meet soul mates. My luck came in a group for four girls. So, when one of them announced she was getting married, it was a big deal. What would we do? Where would we go? This isn’t just some friend having a bachelorette party; this is a kindred spirit of ours that we now had to share with someone else. What could we do to make her last days as a single lady, unique and memorable? It started with a destination. After an eternal email thread debating on where we would go, we decided that since none of them had come to visit me yet, New Mexico was the locale of choice. This now meant that I as in charge of hosting this landmark event. I narrowed the elements of the weekend that needed to exist, to three components: debauchery, relaxation and sentiment. Being Olympians at the sport of debauchery, I wasn’t worried about it. Relaxation was an easy one too. It was the “something sentimental” that I really had to think about. Then, a moment of brilliance. I asked them to think of an item that they love and to purchase four of them; one for each person attending. It could be anything, so long as it was a favorite of theirs. This would cover the sentimental element of the weekend. The girls flew in from across the country and landed in Santa Fe, New Mexico for our bridesmaid exclusive weekend. We got straight to business: debauchery was effortlessly achieved at the Coyote Cantina, and seemed to follow us to the Jemez Hot Springs (a trademark tendency of this group). Before we cared to admit it, the last night was upon us. As we all got ready for the evening, I told the girls to collect the items they brought and bring them with us to the restaurant. We piled into the car and walked into the Artichoke Café for our dinner reservations. Wined and dined and laughing about memories past, there was no better moment than to exchange our treasures. We pulled out our favorite items and set them on the table. Then, we distributed each item so every one of us had a favorite item of the other. This meant that we each ended up with: a miniature of Macallan scotch, bathtub confetti, Himalayan pink salt, Burt’s Bees chapstick and a Frisbee. Each of us now had a beloved item of the other that would remind us all of this pre-wedding weekend. This year, another one in this same group is getting married. She’s requested that we repeat the same exchange of “something sentimental” for her pre-wedding weekend. For more of Katixa’s writing, visit her blog, HERE. You’ll be glad you did! Last Christmas I received a chop saw. Let me tell you, I.was.stoked. I am sort of a tool junkie and the handy woman around the house; so when it comes to spinning blades and the perfect complement to my pink “Ladies Tool”, stop traffic. Here come the DIY projects! Recently I made succulent planters out of some Aspen poles I had sitting around. They were perfect for one of my clients hosting a very woodsy wedding! Hello UP-CYCLING!!! 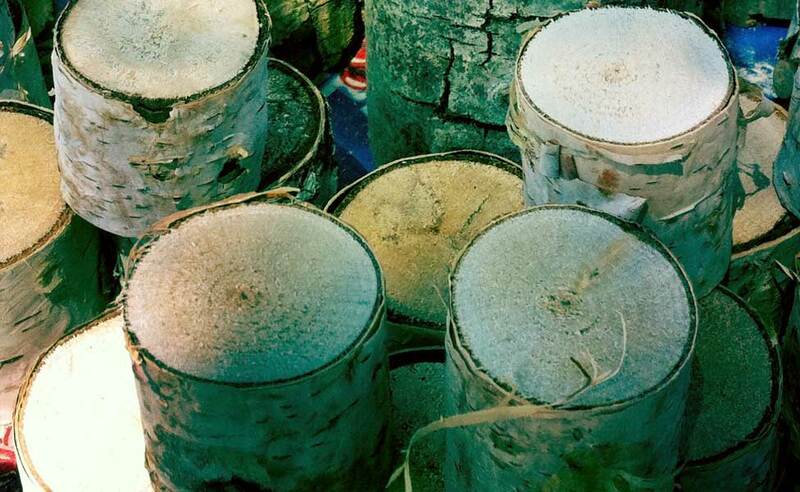 First you’ll need wood poles (Aspen, Birch, etc) that are at least 3 inches in diameter. 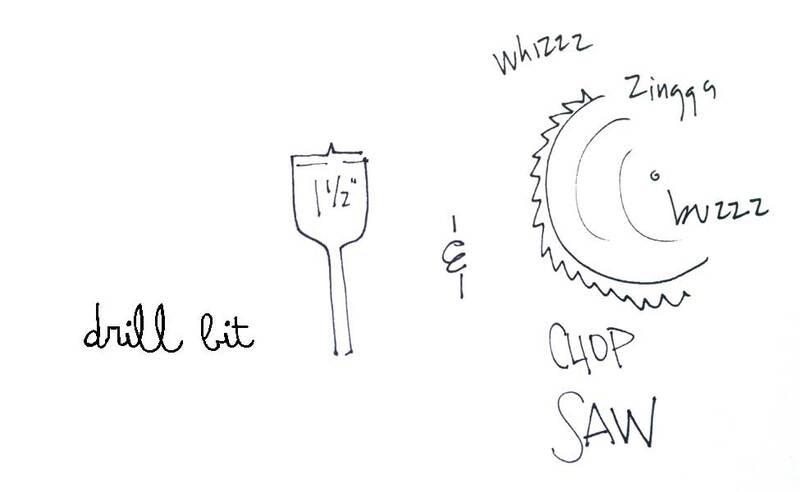 You’ll need to get your paws on a 1 1/2″ drill bit, a drill, and of course, you’ll need a chop saw. One thing you should know about me. I hate to measure. I like to eyeball. This also equals bad baker, but a good cook…and a whole different story. I digress. I decided to cut my poles into sections that were between 4-5 inches long. I wanted them to be proportional with the width of the stump as well as not be too top-heavy once they were planted with the succulents. This is also where the hand-chopping hazard lies. Don’t let your fingin’s get too close or you’ll be in the ER and then next 9-fingered bride. 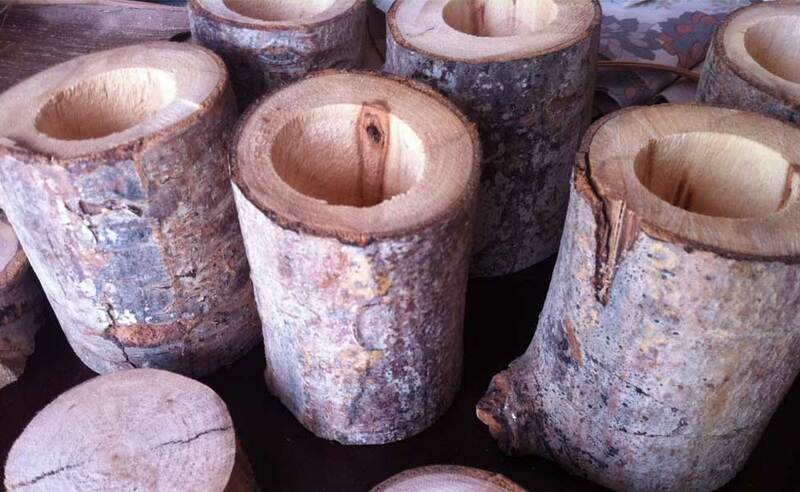 Next, whip out your fancy drill bit, center it on the stump and drill down into the mini stump about 2-3 inches. Now, I just made that sound way easier than it really was. Depending on the density of the wood, you’re going to have to put some serious elbow grease into this part. Also, I should have invested in a vice to hold these puppies in place. Instead, I recruited the Mister and a friend of his to wedge the stumps against the brick wall and drill with all of their might. Bless their hearts for falling for my Tom Sawyer ways! Then comes the fun part! I had ordered a ba-jillion loose succulents to fill all of my new planters. First I dropped a bit of gravel at the base of the planter and then filled it in with some nice yummy soil. 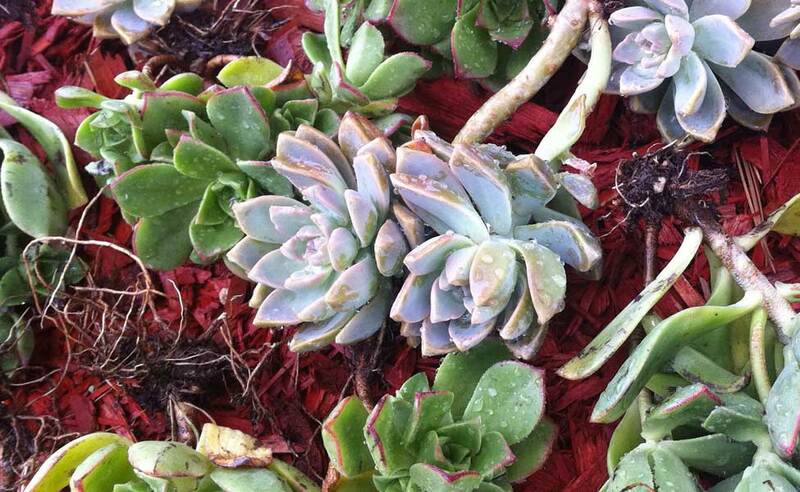 Then, I snapped off a few succulents…as some of you may already know, they are self-rooting and a fresh stem will grow roots in new soil. Amazing, I know. Another sneaky trick: dipping the fresh cut stem in a bit of cinnamon acts as an antiseptic and will keep your succulent healthy. Finished with a little Reindeer moss and BOOM! 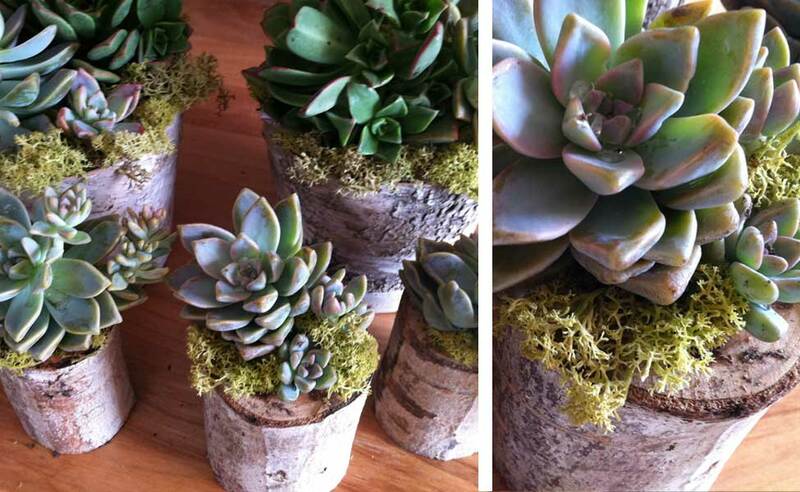 You’ve got the most adorable woodsy succulent planters! I placed them all the way down the reception tables paired with votives sitting on thin wood disks; the whole look was just divine! 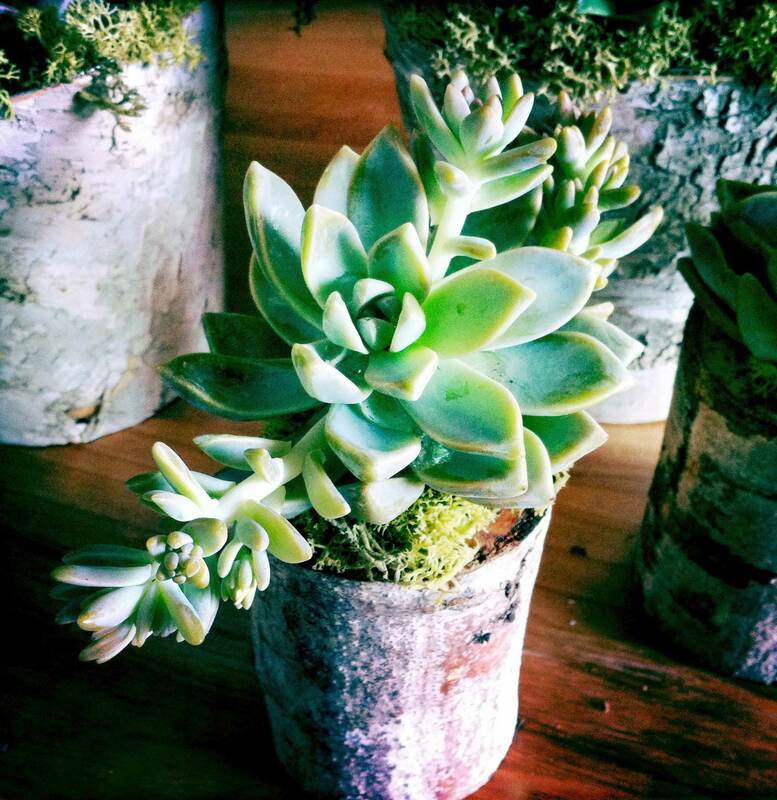 For some of my other succulent planter DIY projects, pop on over HERE.